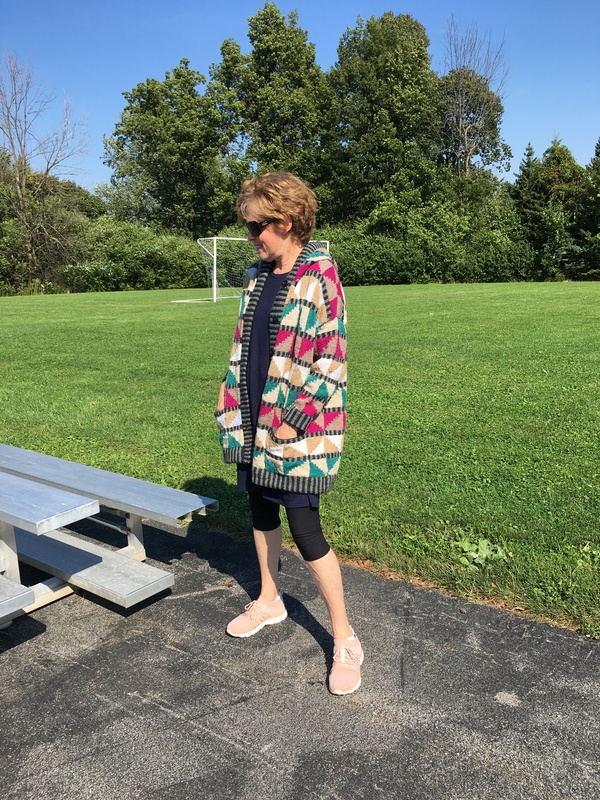 I am talking about a recently finished garment, my first of 2018. First due to the nature of my newly single life (adjusting/managing/accepting) but also first due to the intricacies of what was on my needles. 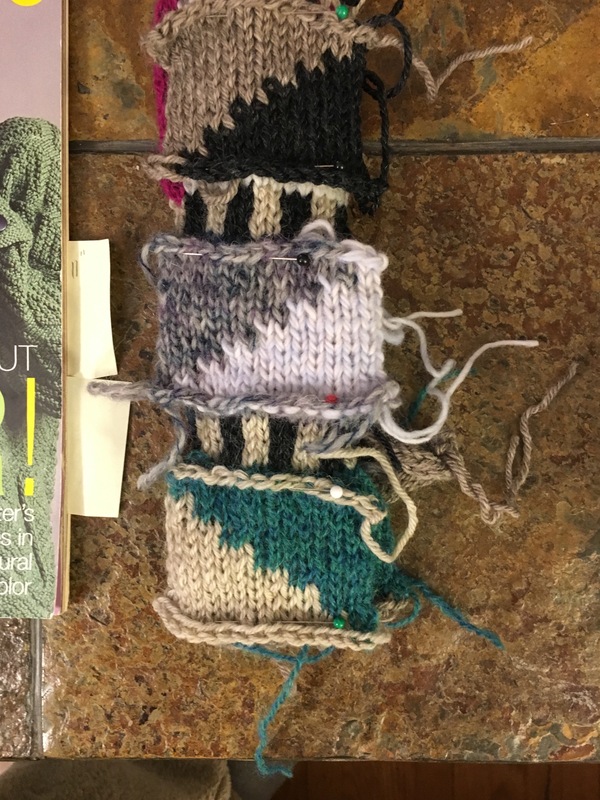 In all fairness to the publisher of Vogue Knitting, the pattern was marked as ‘expert’ which means a high level of difficulty to knit, so I guess I was warned. 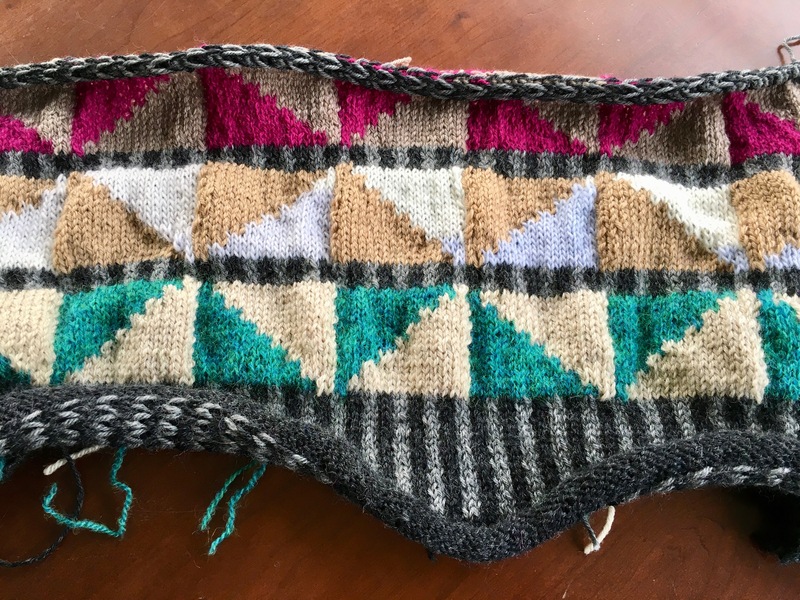 This post is mostly about the technicalities of knitting this particular piece so now I am warning you! Thinking if any of you want to take this on, my notes may serve as helpful. 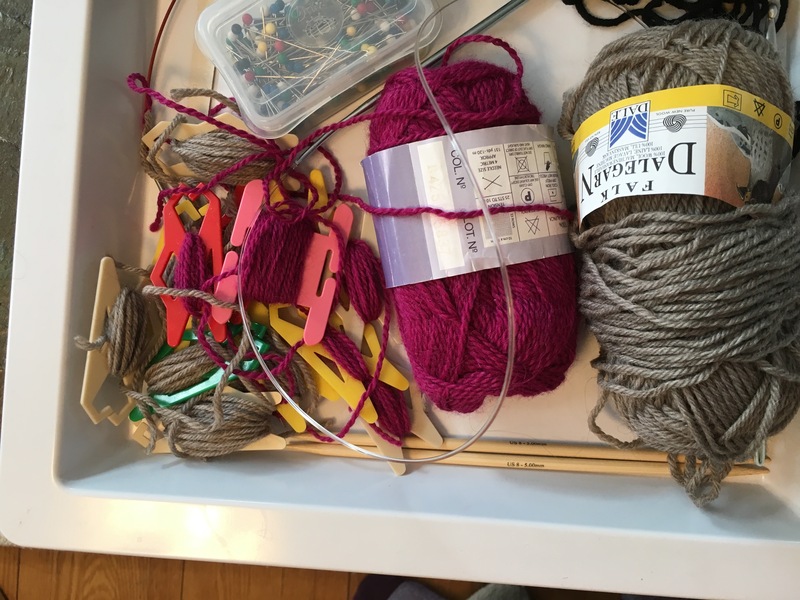 The rule for a project (truthfully, any project whether in knitting or otherwise) is to begin with the end in mind. 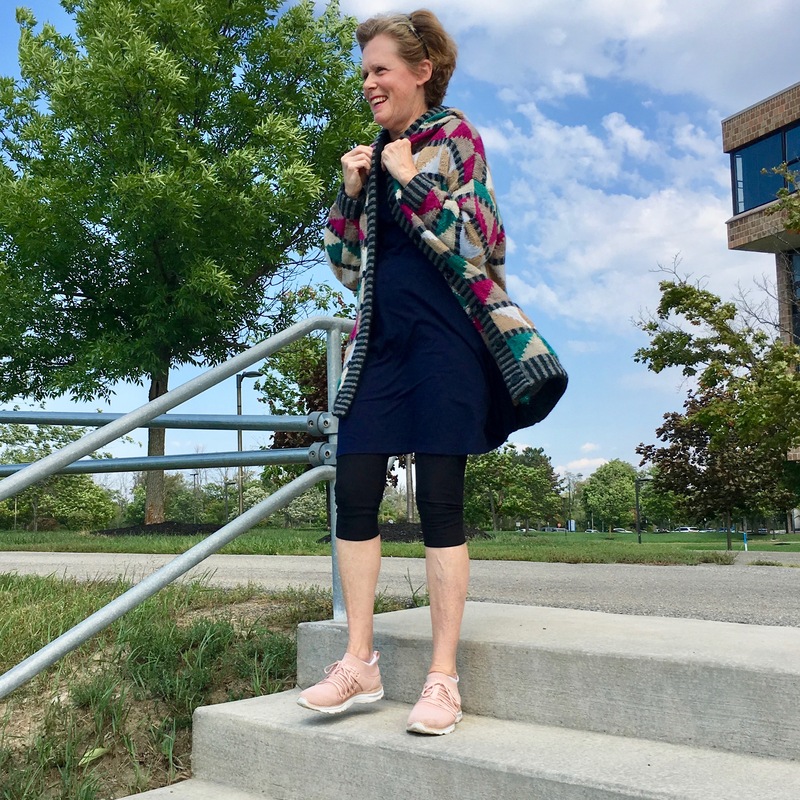 Before I knitted the first stitch, I thought of how I was going to sew the pieces of fabric together that I would be creating. I decided right then I was going to crochet the sides together which meant adding a selvage edge (an extra stitch on both sides) on all the pieces. So, immediately the number of stitches to cast on changed from the pattern. There was the triangle pattern. 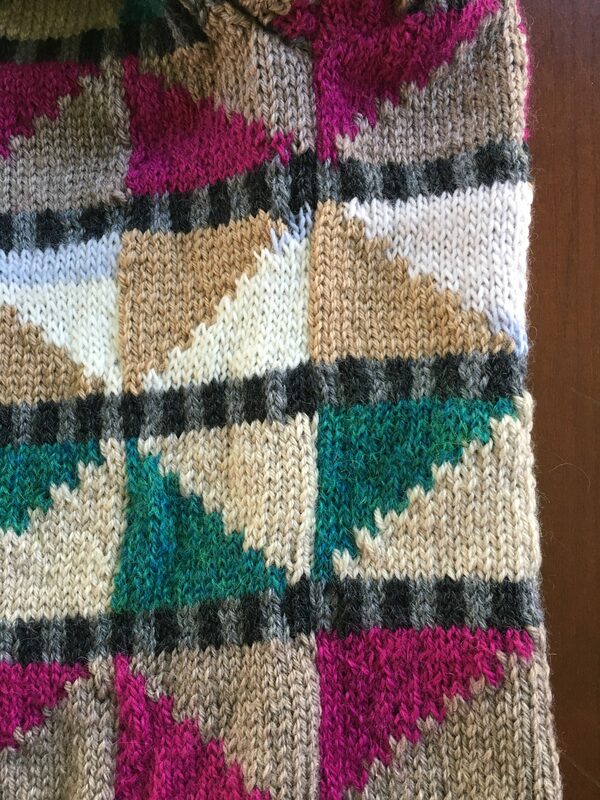 I stared at the picture in Vogue Knitting Fall 2007 and couldn’t get past my observation that the pattern of triangles on the fronts did not line up. Yet, the version (yes, the same Missoni pattern was in two issues) from 1991 did. It actually was the COVER design, then. 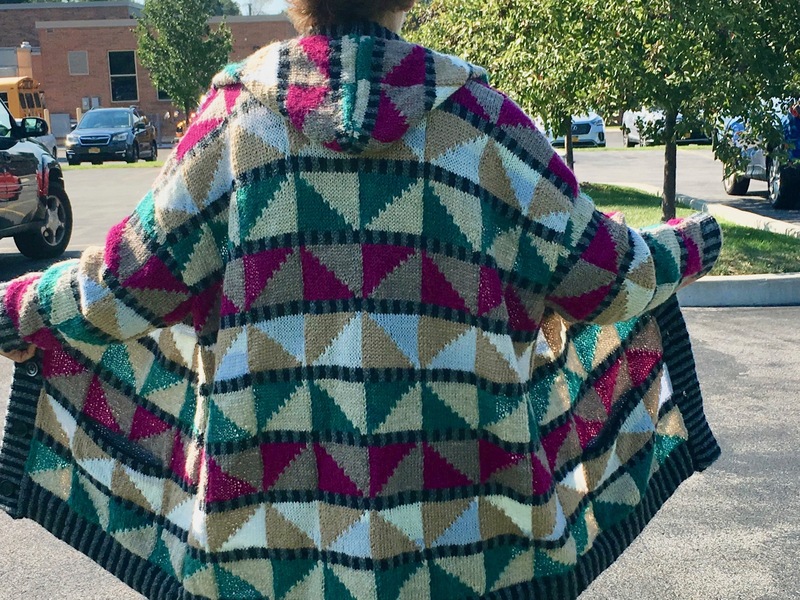 I decided I wanted the triangle pattern of mine to match across the back and front, up the sleeves and through the hood so that had to be planned. Then, I read the entire pattern. It was at this early time I began wondering about the front band. Many questions. 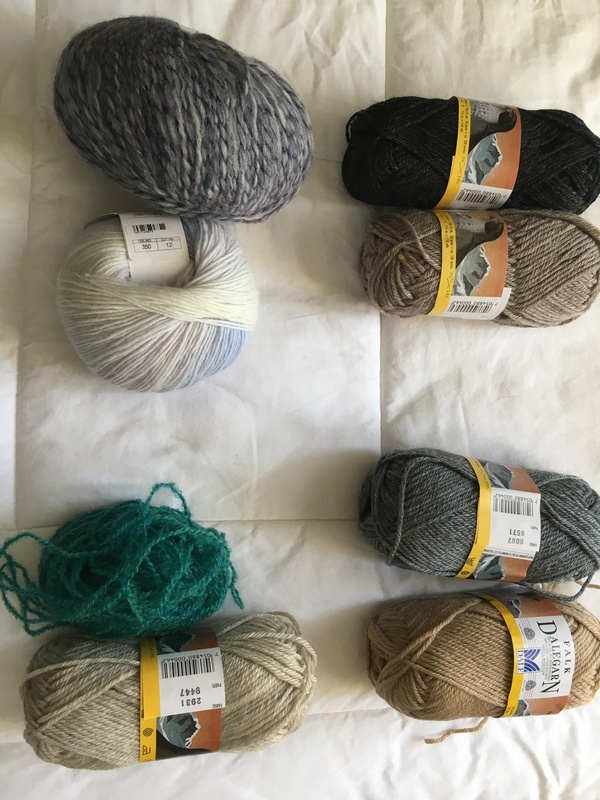 These were my initial steps before heading into gauge and organizing colors, which are major feats in and of themselves. 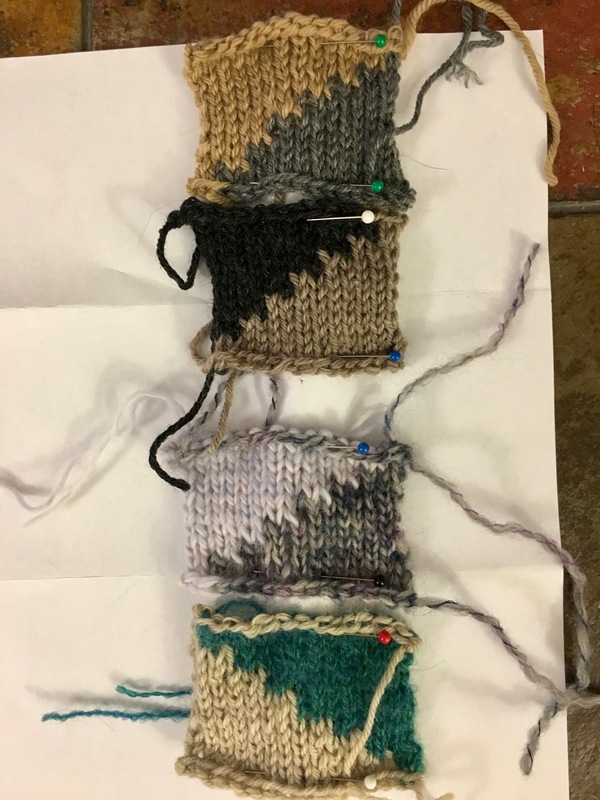 Here is my knitted swatch effort and ‘Swatches’ pdf done by a dear friend in helping me with color play. My rule of thumb regarding color is colors within the same hue go together. I also wanted the Missoni look. I love seaming. I think I love seaming due to the crochet method which is really just that, using single crochet to hold the pieces of knit together. I think a selvage edge takes me to my sewing of days gone by. Fabric that is manufactured has a selvage edge. 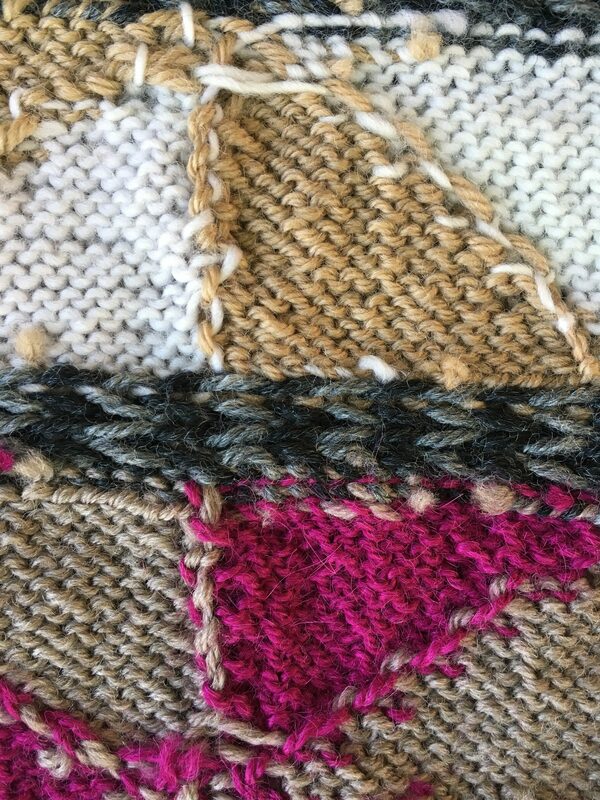 Applying the concept to my knitting is very captivating. A selvage edge is simply knitting the first and last stitch of every row (no matter the pattern). 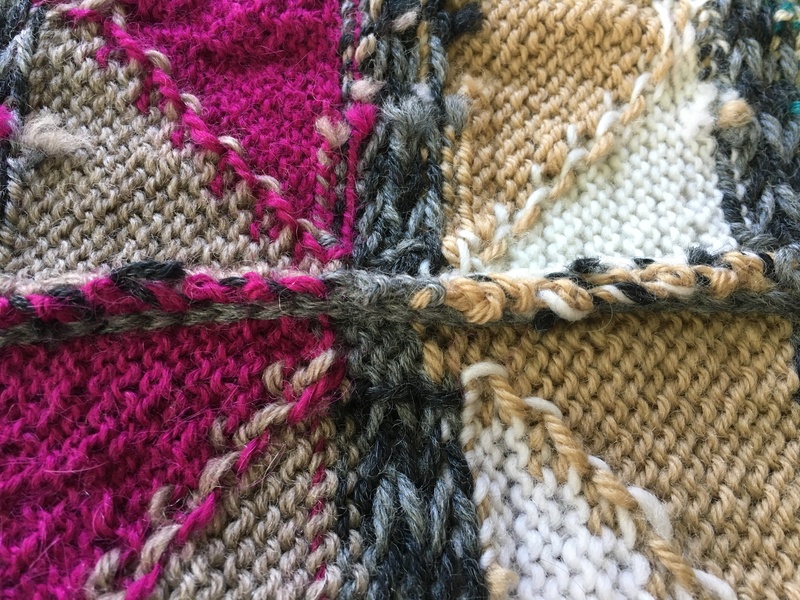 This gives an edge that allows the crochet hook to easily slide through as well as allows the nap of the knit stitch to line up perfectly on the right side when the garment’s pieces are sewn together. Here are views of both the inside and outside of a seam that is crocheted together. The top photo shows the seam on the outside (can you see it?) and the bottom photos are images of the crochet chain stitch that, to me, looks professional. 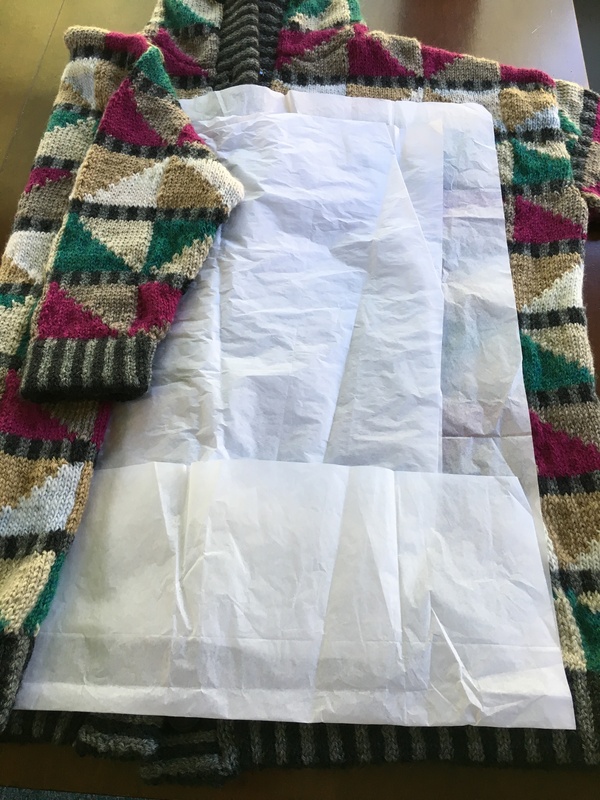 I work very hard at having the inside of a garment look as finished as the outside especially in a coat or cardigan. Why? 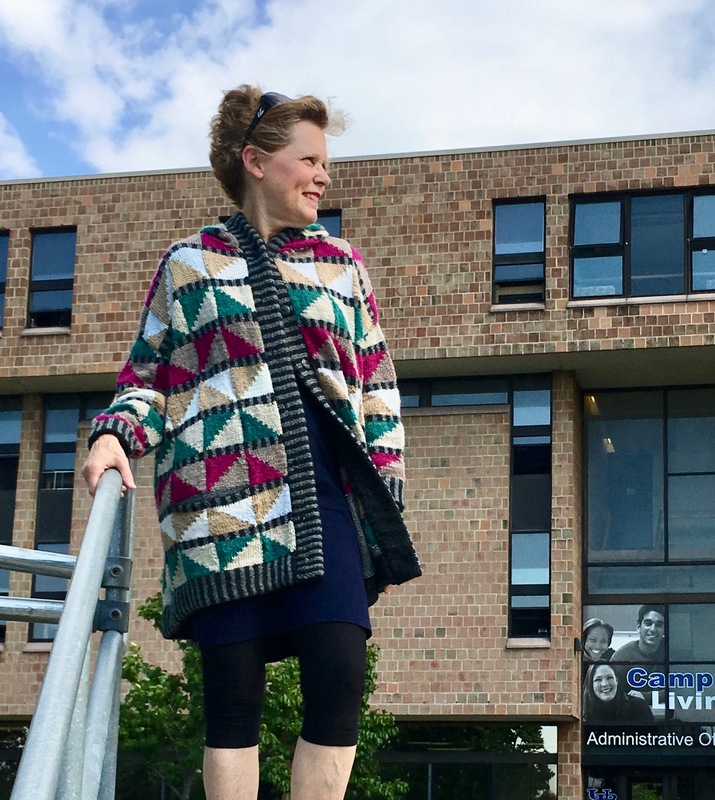 Think of what we do with coats and cardigans. They are often cast aside when the temperatures get warm. Therefore, the insides of these garments are oftentimes exposed. 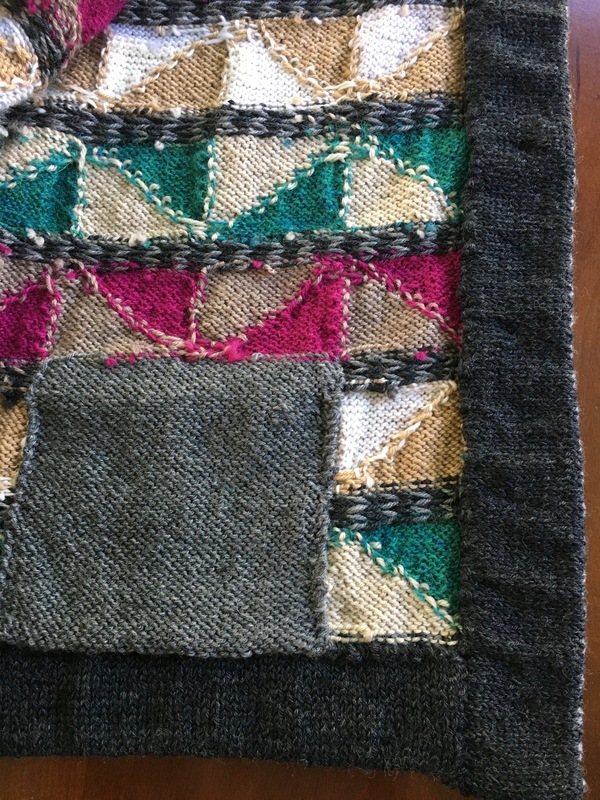 In talking with Boknits, a designer on Ravelry, she shared with me a method she uses for sewing seams shown HERE. In French, but the visuals are universal. I should probably explain also that my yarn fibers are not the same. 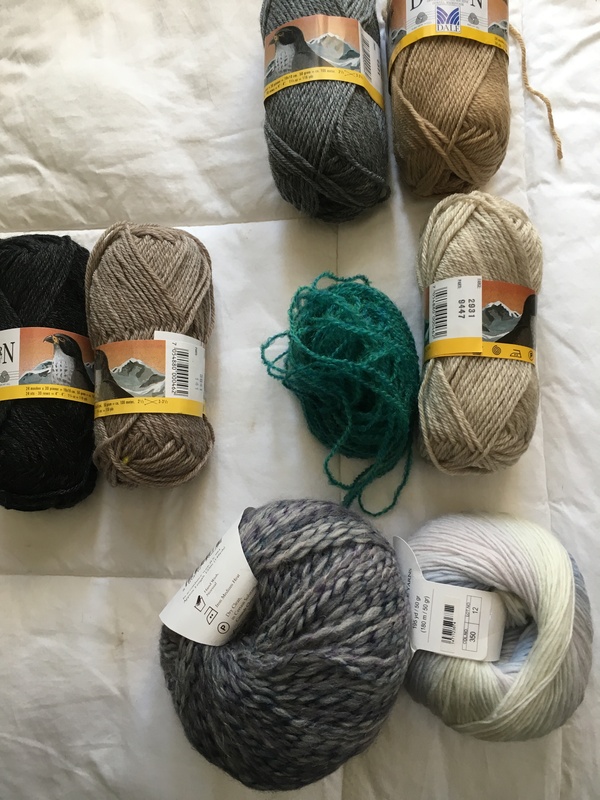 Here are the yarns I used with their bands: a mixture of alpaca, mohair, and merino wool. 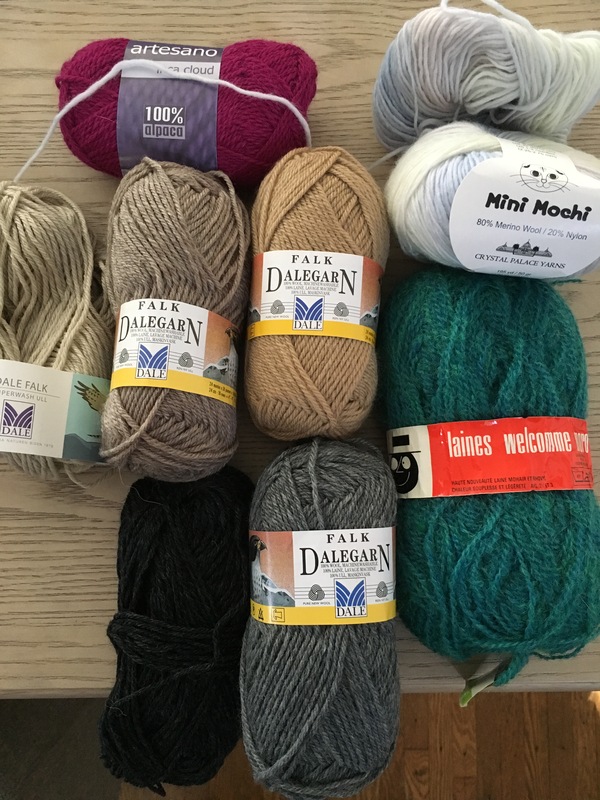 The Falk Dalegarn is a washable wool. 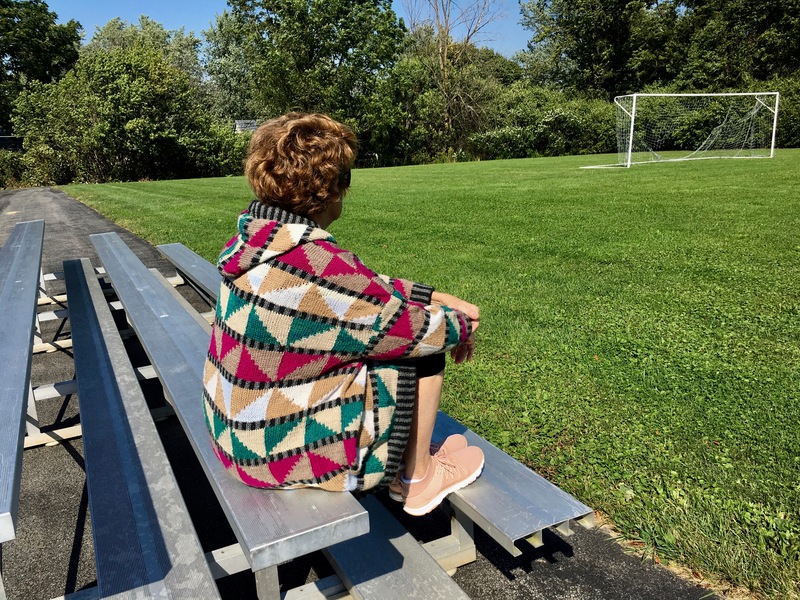 All of the fibers are of a sport weight (or similar) which brought them together, aside from what I thought, was a pleasing, Missoni-like color palate. Due to the fiber differences, I was lenient with the ‘lay’ of the fabric. 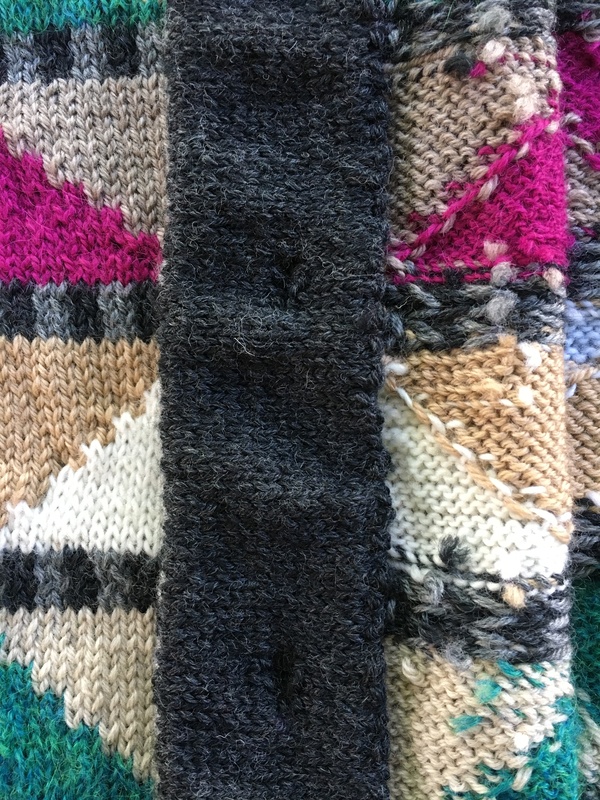 A couple notes on the construction of the fabric ~ This project is knitted entirely with bobbins aside from the black and grey stripes in the fabric and bands which are worked carrying the two yarns, intarsia-style. That does cause those rows to be tighter in gauge which you might think a bad thing but actually I feel those rows give the fabric nice stability. 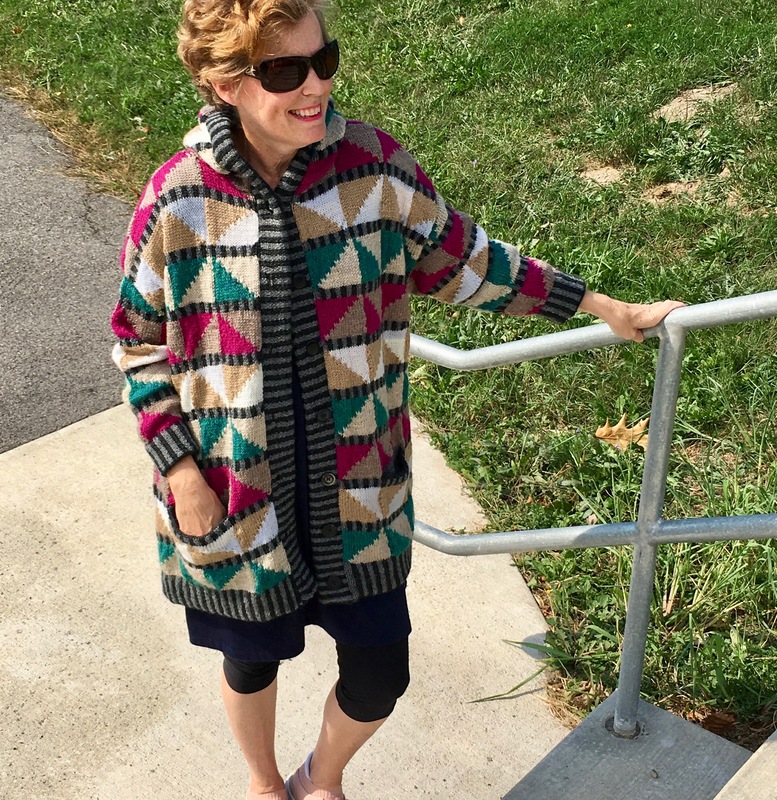 Because this garment is a jacket and I used sport weight, I carried the yarn at all the triangle points. That means that not only are the grey and black stripes stable, but so are the four rows above and below. Every row uses two colors. To make life easier, I used baggies to keep the two colors I was working with organized. So, it was a constant switching of the baggies throughout the project. (I hadn’t learned about the baggies, yet in the above photo.) Here is a picture where you might be able to see those yarns that I carried at the points of the triangles in the bobbin section of the fabric. Aside from applying these techniques and remembering to add selvage stitches with each new piece of fabric I was creating (including the hood sections) and being VERY aware of the triangle pattern flowing throughout the garment, it was months of forging. See NOTE BELOW not in pattern. 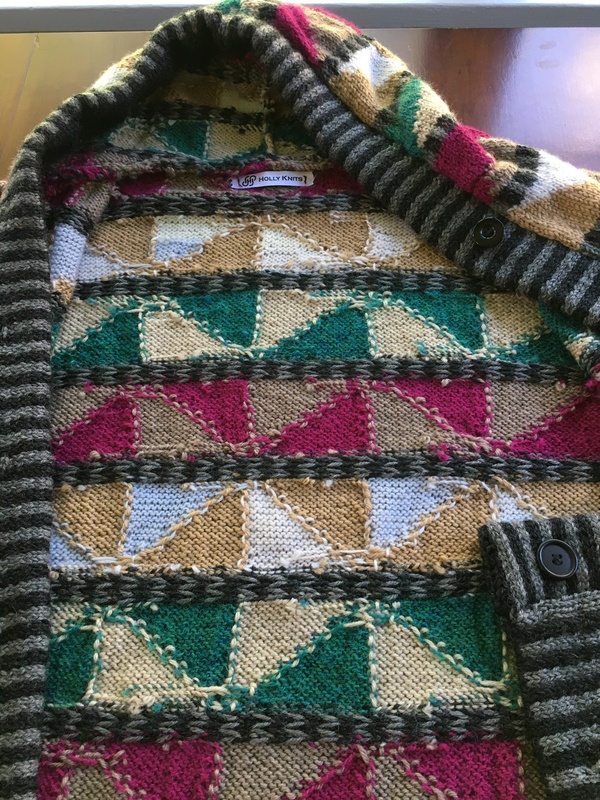 For triangle pattern to continue as established through hood, begin at stitch 26 on row 43 for left side of hood. Begin at stitch 1 on row 43 for right side of hood. The front band and its lining. Oh, boy. 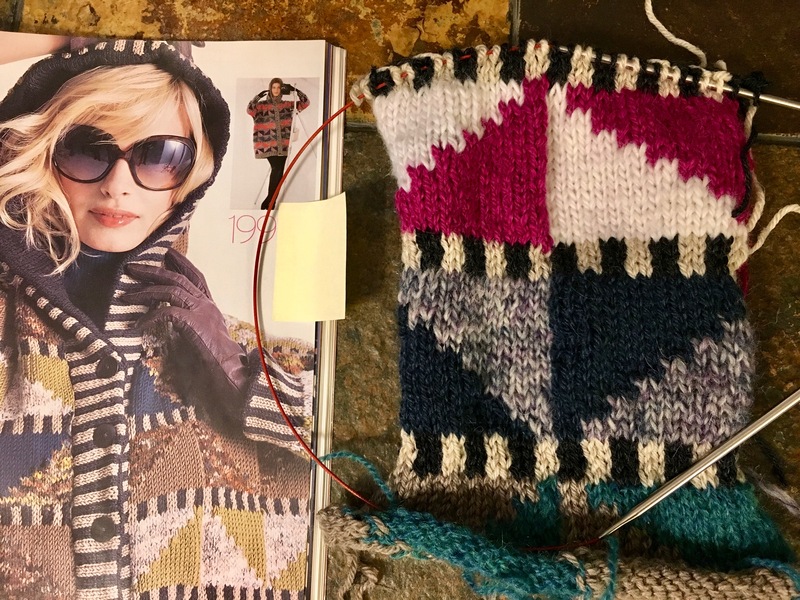 The front band is tricky for a few reasons: the fit of the band to the front edge of the sweater, gauge (always), and buttonholes. 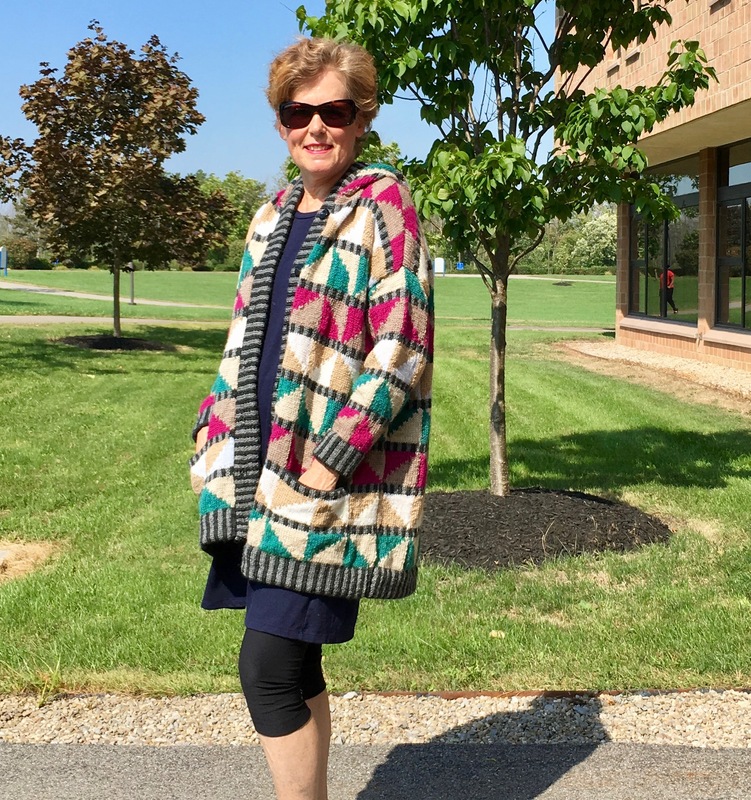 The pattern calls for one to knit the band separately and to sew it on later. That would create a seam which adds stability as well as serves as an anchor in which to sew the knitted lining. Another method is to pick up stitches along the front and knit the band from there. This insures a proper number of stitches for the band to fit along the edge but possible stretching of fabric and no anchor. I went with knitting it separately, then sewing it down (again using the crochet method), over the seam, as you can make out in the photo. I felt quite a sense of relief that the band fit nicely with the first attempt. I used the number of stitches given in the pattern, checked to see if it would make sense to my gauge allowing for a bit of stretch the way it should and knew the hood was there to take a bit of slack. You can also see the pocket lining which I would have preferred in the charcoal grey but was worried about yardage. It is sewn all the way around. Here is pocket detail on the front. I say the gauge of the band as it really has two gauges. 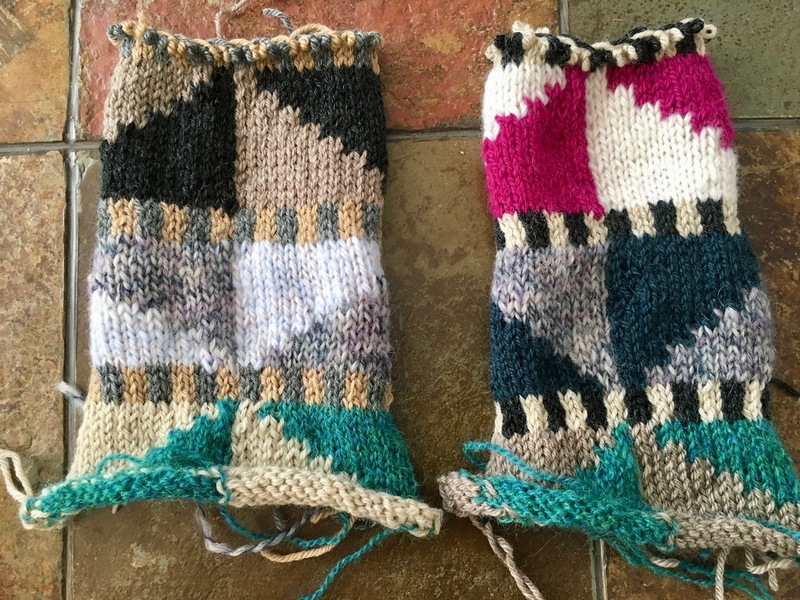 Whenever you knit with two yarns intarsia-style there is a bit of pulling making the gauge tighter. It’s almost like weaving. You can see the weaving look in the photos of the wrong side of the fabric, above. The lining is in one color, straight st. So, when the band’s lining is knitted, it fans out. It is tricky. Questions I asked myself . . . Does the side where the band is going to be sewn to the garment fit the way it should AND when you sew the lining down, is there enough give so that the lining lies flat? Also, I was thinking about making sure the seaming would keep to the four stitch color stripe pattern. Then, there were the buttonholes that had to be made in the band AND the lining with the idea of sewing the two together in the finishing. Yikes! I had never done that. 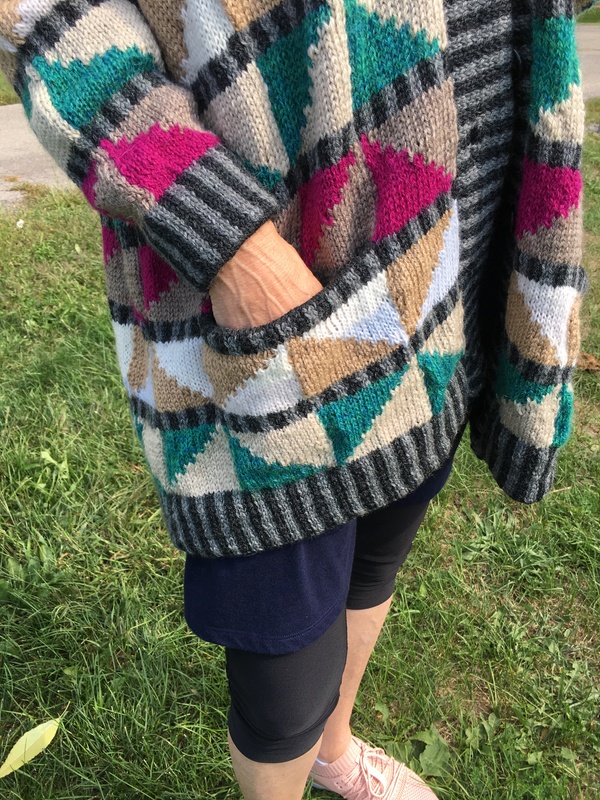 I used the one-row buttonhole for the band that offers a finished look where the button NEVER PULLS OUT and for the lining, I used the method that is described in the pattern. Knowing I was sewing one to the other, I could make the buttonhole look and work great. Wrong side of buttonhole band, you can barely see the buttonhole. 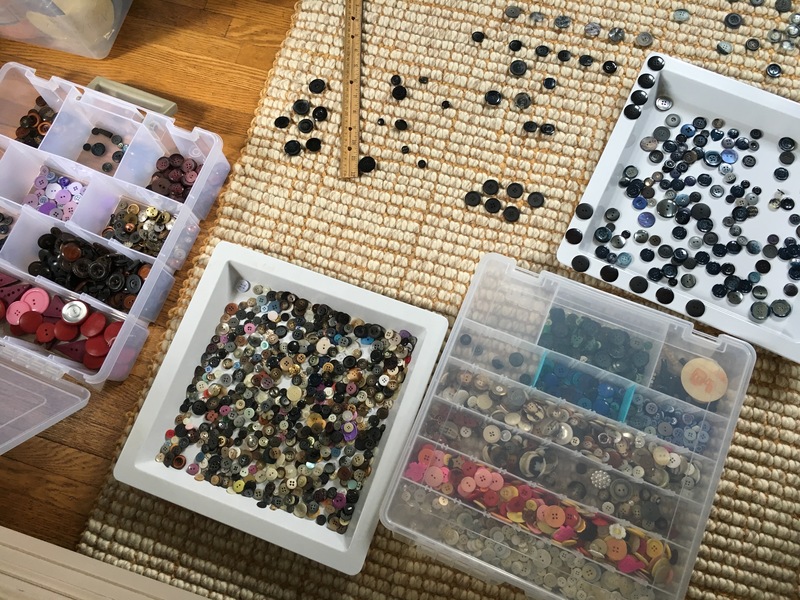 The buttons are inconsequential to this project, so I pulled mismatched buttons from my collection, only similar by color, size, and four-hole. I sewed them on by splitting the yarn. I am pleased with the way the buttonholes came out. Snaps are often used on projects such as these as buttoning and re-buttoning clothing adds wear and tear on a garment. 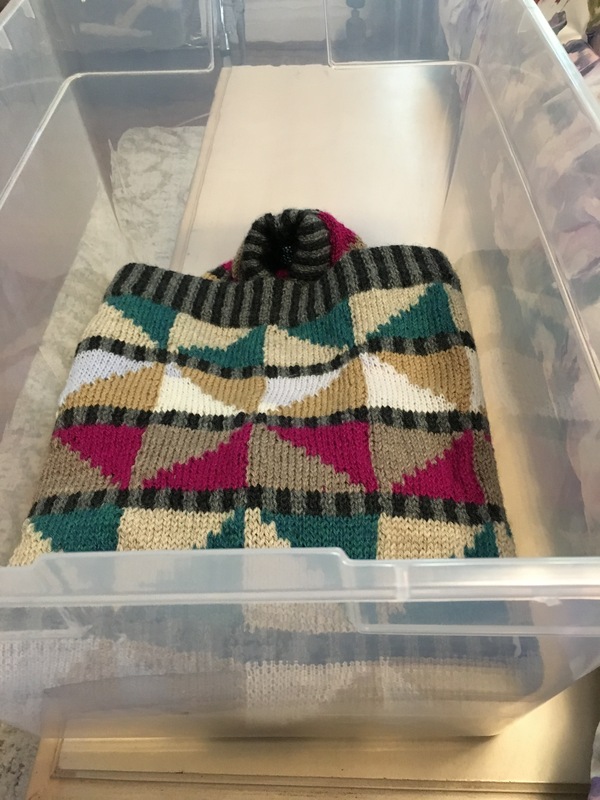 Truly these hand knits can last a life time if handled and stored properly. I know that but so prefer the look of buttons and buttonholes. Here you see the these details. 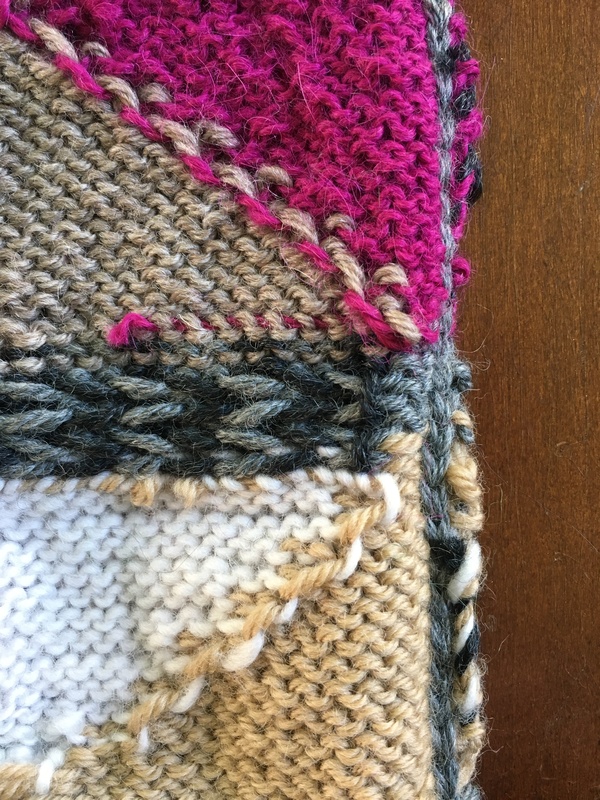 The last comment on technique I have is on the weaving of the ends. The process is weeks long and there is more than meets the eye in the technique of weaving. Again, I care about how the inside looks therefore I made every effort to weave in the ends to follow the triangle’s perimeters. I used a crochet hook, some use a large-eyed needle. One can barely see the ends on either side. Don’t forget to sew in your label! Here’s how she looks. The front band is my favorite part. You must see the hood up, of course! It was windy, but we had fun. The net was calling me. 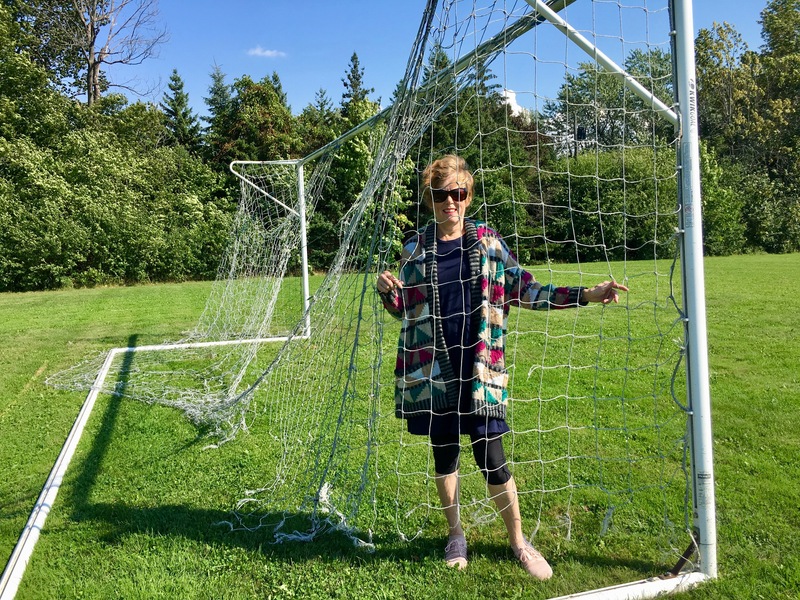 There was a hole in the net, I should have been more creative. That sign just happened to be there. As I said, we take off our cardigans. Here you see how I store my pieces with easy access because I wear them. I continually tend to their care, wrapped with acid free tissue paper on the inside, folding sleeves to the outside, in a plastic bin with lid that will hold others and be placed in as cool a spot as can be found. 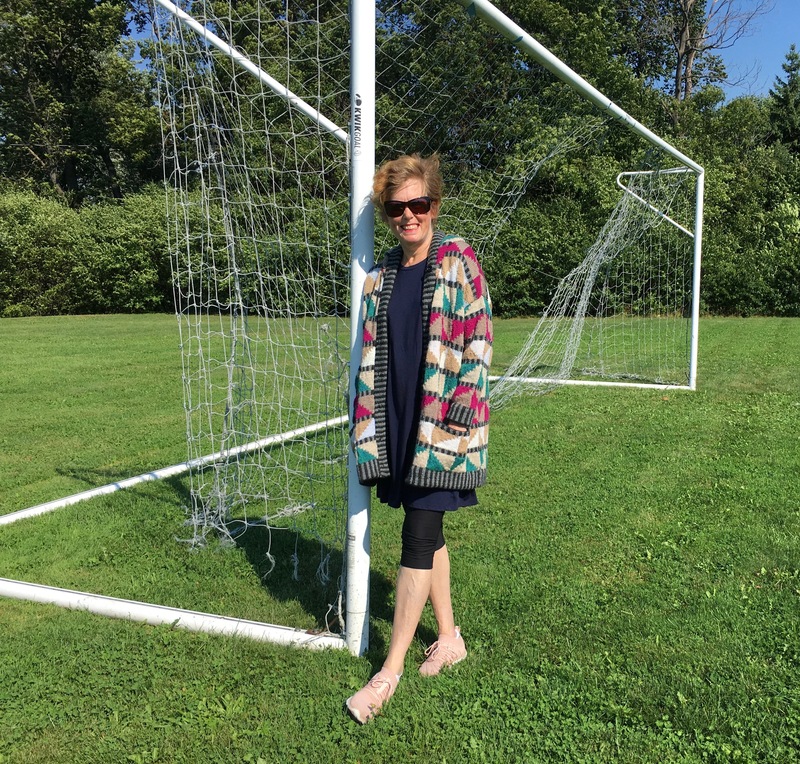 If you click on the link for Vogue Knitting 1991, you will see one of my photos has been chosen as the Featured Photo for this pattern! That is just inspiring, I love it! All of it! What a great accomplishment, and how wonderfull of you to share the details. Wow Holly – just spectacular! I am in awe. 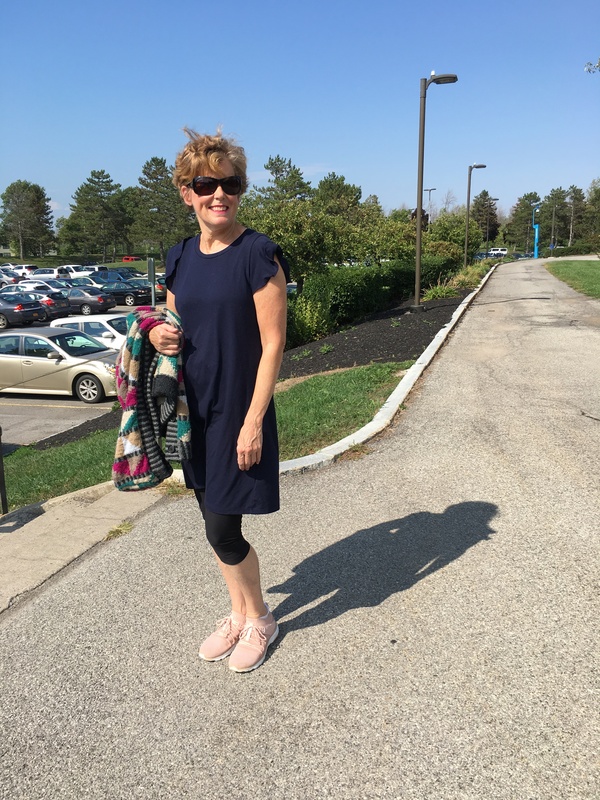 Are you wearing that to Walk the Runway at VKL NY? I was thinking about doing that with my Viking Wrap but that can’t hold a candle to your project. You are incredibly talented. Thank you, Mindy. We all have talent and I am sure your Viking Wrap is lovely. If I were attending VKL, I would indeed enter this for the runway. I think I may be skipping one or two years of attendance and then when I do return, this could be one of the contenders. I’m sorry you won’t be there. I was hoping to connect in person…and of course to see more of your spectacular creations. Your talent is so inspiring!! I feel like you continually push yourself to learn and try new things. 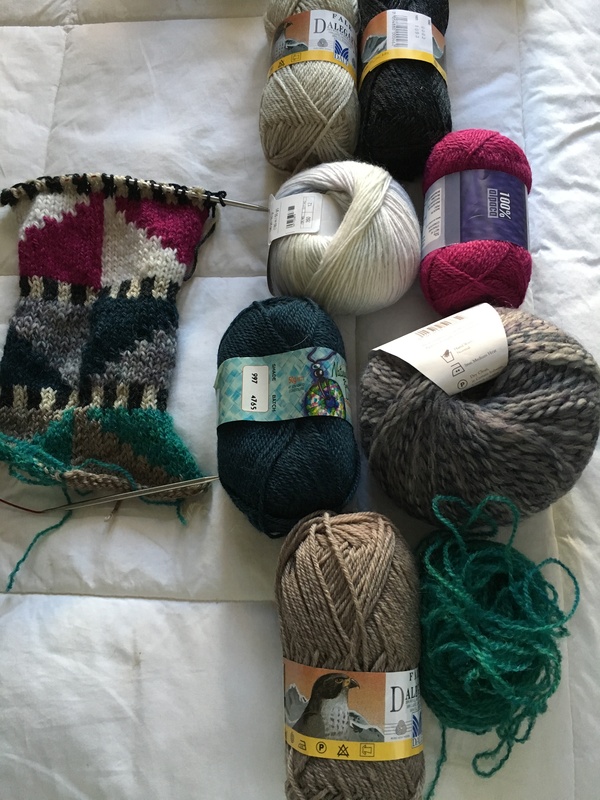 I don’t do that often enough although I have just started a brioche project and had to start over a few times till i “got it”. Thank you for the inspiration and helping me to get out of my comfort zone! Mindy, Next year? 2020? Brioche, on my to do list, as well. We do inspire one another, maybe my favorite part of knitting. That would be awesome Holly! 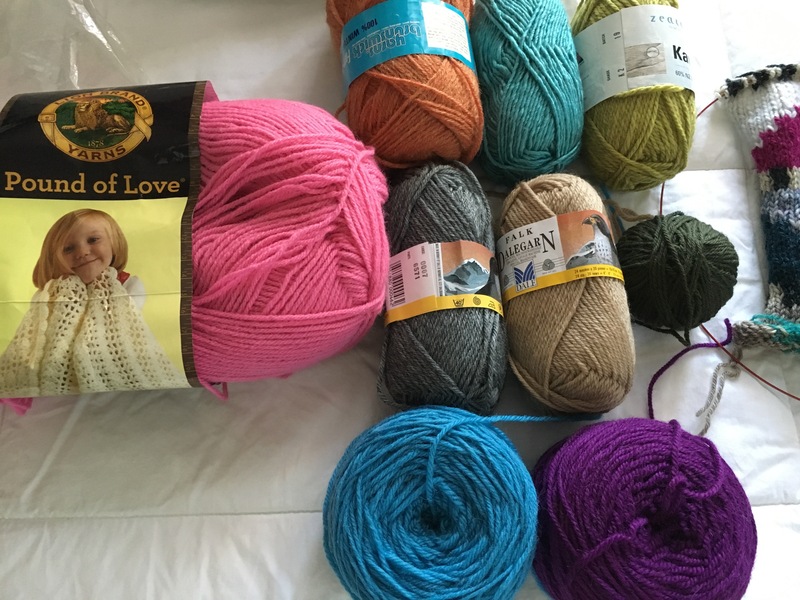 I’m really hooked on brioche now so looking forward to seeing what you do with that stitch. It is unbelievably beautiful and looks so complicated…and like so many things, once I saw how to do it wasn’t complicated at all. Such a work of art, Holly! Beautiful and so worth the planning time taken to ensure perfection! The finished garment is lovely and really suits you, especially in your chosen colours. 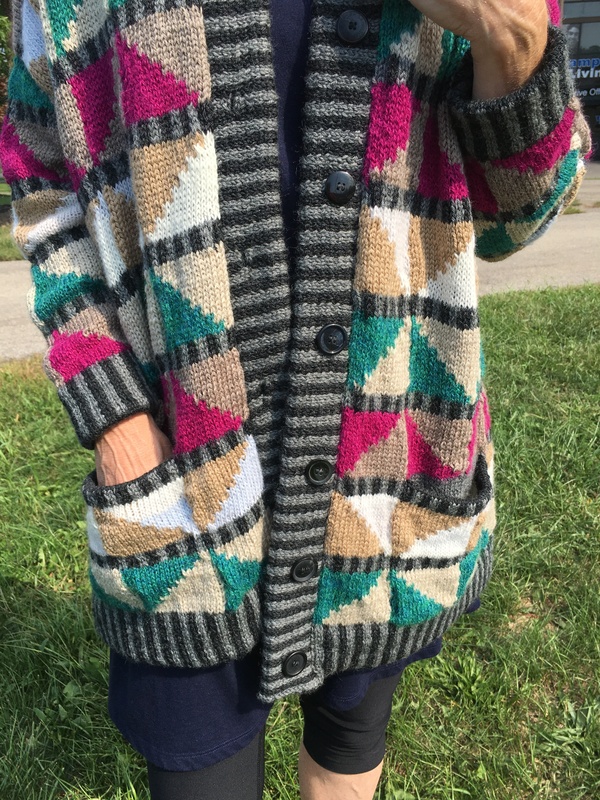 Congrats on finishing this expert sweater … you nailed all of the details, even down to somewhat mismatched buttons! Oh, and love the new ‘do’; it really suits you! Thank you, Karen on all of your kind words. I do hope this proves to be ‘grabbed’ as predicted. The hair, comfortable. It really took an expert to nail this, and you’re the one. That was a lot of work, and tricky too! 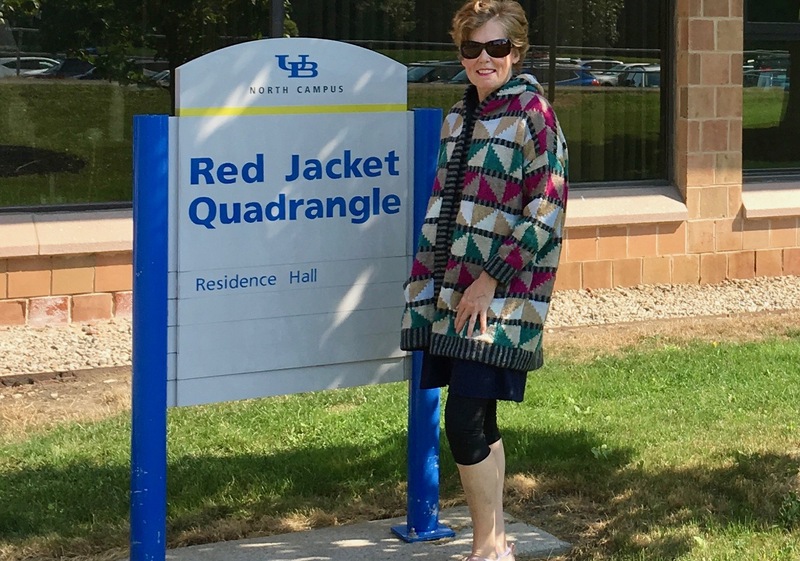 Congratulations, it is really a beautiful jacket/coat/cardigan that you can wear with pride. Thank you, Agnes. I was trying to think of what I’ve knitted that has been as tricky. I do have a brioche pullover planned that may prove similar in difficulty probably because I know nothing about brioche! haha But, for now, some simpler projects. Thank you for the copious and indispensable notes. 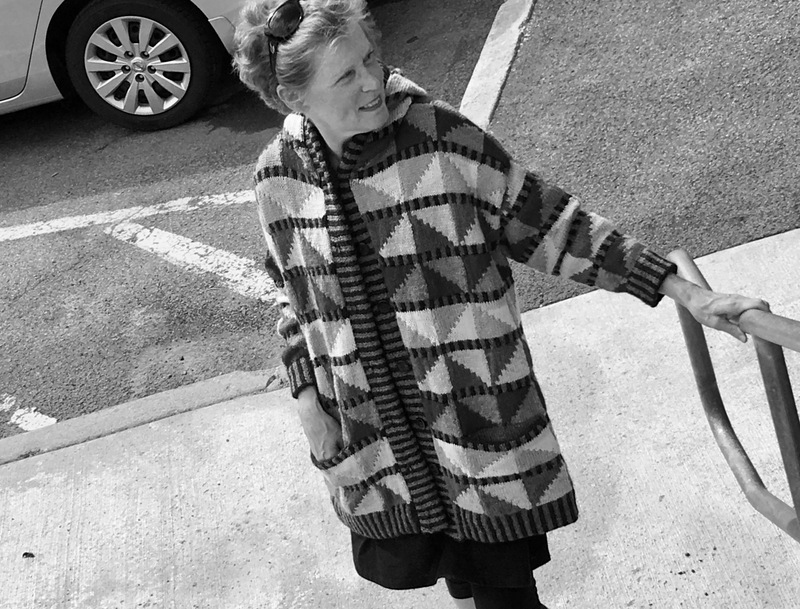 Your Missoni lookalike is gorgeous, and your attention to (exquisite) details has paid off in spades. Laura, Thank you so very much. Those little details . . .